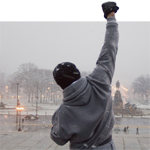 Rocky Balboa is Sylvester Stallone’s best movie in 30 years. Rocky Balboa is the iconic “Good Man.” He found one good woman, Adrian, his muse, and together they tackled life’s obstacles. A good-hearted hooligan (once he gets his break and finally realizes his own potential), Rocky never lets his grip slip on the pursuit of happiness. Defying standard Hollywood formulas, there is no womanizing, no philandering. That is not what the character of Rocky Balboa is about. Granted, Stallone has created his own formula with the Rocky movies and sometimes the results have been mixed, particularly in Rocky IV (yeah, the one with the Russian and the in-film music videos). Nonetheless, Stallone has taken his cache of characters through an epic journey. Looking back now on all six movies (all written and directed by Stallone except for Rocky and Rocky V, which were directed by John G. Avildsen), there is quite an arc to the life of Rocky Balboa. A perpetual underdog, the Italian Stallion would rise to the top, retain his title, lose loved ones, and ultimately lose his riches to some bad business dealings behind the scenes. Sent back to the cramped row houses of Philadelphia in Rocky V, his indomitable spirit remained intact throughout. Challenged, questioned, and doubted, Rocky would always dig deep and rise to the occasion. It’s been 16 years since Rocky V and, to put things in some perspective, Rocky Balboa is the first movie in the series to have a Web site. Since the previous movies covered a full range of storylines, this latest installment met with lots of skepticism from the moment it rolled into production. Was it just an ego trip for Stallone? A sly way to make some sort of comeback (again)? One of the amazing things about Rocky Balboa is how little the boxing matters. It takes a back seat to the far deeper themes that run like a raging river through this movie. Yes, there is a big fight at the film’s end. But it’s a relatively good-humored exhibition match between Rocky and Mason “The Line” Dixon (Antonio Tarver, a former light heavyweight champion). Dixon, the reigning champion, has lost favor with fans and the boxing industry because of his penchant for taking on unworthy opponents and thereby easily keeping hold of the title. Rocky’s been biding his time for the past decade as the host at Adrian’s, the Italian restaurant he started with his wife. Moving from table to table, he charmingly poses for photos with guests and regales them with tales from the ring. But now Rocky’s extremely lonely. It’s not really a spoiler to say Adrian passed away four years ago and Rocky’s been listless, making an annual tour of the hot spots from the early days. Mick’s gym, the Lucky Seven Tavern, the pet shop, the ice rink (which was recently razed). As his longtime pal and sometime adversary, Paulie (Burt Young, Transamerica), says, Rocky’s been “living backwards” these past few years. Rocky Balboa takes a surprising turn as the most heartfelt movie of the series. Stallone’s performance here is laid-back, raw, and 100% genuine. As the story unfolds, minor characters return. Rocky’s opponent in the opening scenes of the first movie, Spider Rico (Pedro Lovell in his only cinematic role), is now a regular customer who insists on washing dishes in return for Rocky’s graciousness. And there’s Marie (Geraldine Hughes, Duplex), the girl who 30 years ago told off Rocky and called him a creep; now she’s working at the tavern. In Adrian’s absence, Rocky finds himself reaching out even more to build a new support network; he latches on to Marie’s son to fill the father-figure void in the kid’s life. And he also finds himself shunned by his own son (Milo Ventimiglia, TV’s Heroes), who has struggled with his career in accounting while perpetually living in his father’s large shadow. It’s interesting to ponder how Rocky Balboa would be received if it weren’t the sixth installment in a series. But, at the same time, this movie’s overwhelming success is due in part to all the Rocky baggage that has preceded it. Rocky acknowledges that the older he gets, the more stuff he has to leave behind. He still has his demons to fight and he still has “stuff in the basement” to get out of his system. And so, through a series of events kicked off by an ESPN computerized match up between Mason Dixon’s skill and Rocky’s will, Rocky finds an opportunity to release the beast that burns within. While getting beat up by Dixon, Rocky struggles to recall his own words, the bit of advice he gave his own son about life. It’s about how much you can take and still keep moving forward. As stated earlier, this movie isn’t about the boxing. After the match, Rocky leaves the arena shaking hands and hugging those in his support network. The judges are reading off the results as Rocky walks away; he doesn’t care what they think. For Rocky, it wasn’t about the boxing. Like an unexpected punch from a southpaw, Rocky Balboa arrives as a deeply heartfelt conclusion to Stallone’s Rocky saga and as the most soulful movie of the year.